For the past twenty years, I have been carrying out experiments to find out how power is distributed in groups. I have infiltrated college dorms and children’s summer camps to document who rises in power. I have brought entire sororities and fraternities into the lab, capturing the substance and spread of individuals’ reputations within their social networks. I have surreptitiously identified which members of groups are gossiped about, and who receive gossip. To chart the experience of power, I have studied what it feels like to be placed in positions of authority. 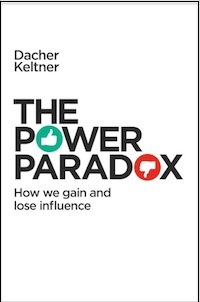 Whereas the Machiavellian approach to power assumes that individuals grab it through coercive force, strategic deception, and the undermining of others, the science finds that power is not grabbed but is given to individuals by groups. Findings from this research converge on an organizing idea: Whereas the Machiavellian approach to power assumes that individuals grab it through coercive force, strategic deception, and the undermining of others, the science finds that power is not grabbed but is given to individuals by groups. Your ability to make a difference in the world—your power, as I define it—is shaped by what other people think of you. What this means is that your ability to make a difference in the world—your power, as I define it—is shaped by what other people think of you. Your capacity to alter the state of others depends on their trust in you. Your ability to empower others depends on their willingness to be influenced by you. Your power is constructed in the judgments and actions of others. When they grant you power, they increase your ability to make their lives better—or worse. When we receive power, it feels like a vital force. It surges through the body, propelling the individual forward in pursuit of goals. When an individual feels powerful, he or she experiences higher levels of excitement, inspiration, joy, and euphoria, all of which enable purposeful, goal-directed action. Feeling powerful, the individual becomes sharply attuned to rewards in the environment and quickly grasps what goals define any situation. At the same time, surges of power make him or her less aware of the risks that attend any course of action. This experience of power propels the individual forward in one of two directions: toward the abuse of power and impulsive and unethical actions, or toward benevolent behavior that advances the greater good. Power leads to empathy deficits and diminished moral sentiments. Power leads to self-serving impulsivity. Power leads to incivility and disrespect. Power leads to narratives of exceptionalism. The abuse of power is costly in every imaginable way, from declining trust in the community to compromised performance at work to poor health. By contrast, when individuals use their power to advance the greater good, they and the people whom they empower will be happier, healthier, and more productive. In my experiments, individuals who were kind and focused on others enjoyed enduring power in schools, workplaces, and military units, avoiding the fall from power that is so common in human social life. That enduring power drives from a steadfast focus on others makes sense in light of what we know: Groups give power to individuals who advance the greater good, and they diminish the standing of those who stray from this principle. How can we stop ourselves from abusing power? What insights can we glean from science so that we avoid mistakes of the past and make the most of our power? The ethical principles that follow are one approach to enabling people to pursue this aspiration. The feeling of power is like a vital force moving through your body, involving the acute sense of purpose that results when we stir others to effective action. This feeling will guide you to the thrill of making a difference in the world. People who excel in their power—the physician who improves the health of dozens of people a day, the high school teacher who inches her students toward academic success, the writer whose piece of fiction stirs others’ imaginations—they all know this. They feel the rush of dopamine and vagus nerve activation in the purest moments of empowering others and lifting up the greater good. If you remain aware of this feeling and its context, you will not be entrapped by myths that power is money, or fame, or social class, or a fancy title. Real power means enhancing the greater good, and your feelings of power will direct you to the exact way you are best equipped to do this. Power is a gift—the chance to make a difference in the world. People who enact their power with humility enjoy more enduring power. Ironically, the more we approach our power, our capacity to influence others, with humility, the greater our power is. Don’t be impressed by your own work—stay critical of it. Accept and encourage the skepticism and the push-back of others who have enabled you to make a difference in the world. Remember that others have enabled you to make a difference in the world, and there is always more work to do. The most direct path to enduring power is through generosity. Give resources, money, time, respect, and power to others. In these acts of giving we empower others in our social networks, enhancing our own ability to make a difference in the world. Such acts of generosity are critical to strong societies, and empowered individuals are happier. The more we empower others, the greater good is increased. So give in many ways. This will prove to be the most important foundation not only of your making a lasting difference in the world but of your own sense of happiness and meaning in life. By directing respect toward others, we dignify them. We elevate their standing. We empower them. That all members of a social collective deserve some basic form of dignity is an ancient basis of equality, and it is expressed in our day-to-day lives through respect. Practicing respect requires work. There is no reward people value more than being esteemed and respected. Ask questions. Listen with intent. Be curious about others. Acknowledge them. Compliment and praise with gusto. Express gratitude. We can minimize the tendency of some people to feel below others, so toxic to health and well-being, by practicing the first four principles listed above. We can do more, though. Pick one aspect of powerlessness in the world and change it for the better. The rise in inequality and the persistence of poverty give us many opportunities for such work. Attack the stigma that devalues women. Confront racism. Call into question elements of society—solitary confinement, underfunded schools, police brutality—that devalue people. Create opportunities within your community and workplace that empower those who have suffered disempowerment due to moral mistakes of the past. Such steps may not feel like the game-changing social revolutions of earlier times, but they are quiet revolutions just the same. In every interaction, we have the opportunity to practice empathy, to give, to express gratitude, and to tell unifying stories. These practices make for social interactions among strangers, friends, work colleagues, families, and community members that are defined by commitment to the greater good, where the benefits people provide one another outweigh the harms they cause. Reprinted by arrangement with the Penguin Press, a member of Penguin Group (USA) LLC, A Penguin Random House Company. Copyright © Dacher Keltner, 2016.